Keep your pipe and other valuables safe and secure in this padded, zippered, hard cover case. One side of the case is padded with thick foam and a removable foam center to accommodate different pipe sizes and cushion your pipe however you desire. There is also an elastic strap that keeps your pipe from falling out when you open it. This protective storage case offers a zippered pocket to store your tobacco, lighters or other smoking accessories. The case is discreet and stylish with a cool, shiny, black diamond checkered pattern. An aluminum carabiner clip allows you to attach the case to almost anything. 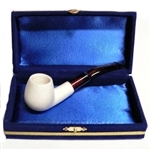 Our entire lines of mini Meerschaum and small deluxe Meerschaum Pipes fit in these cases.